As soon as I got out of the car and saw her from a distance, I recognized her. Her name is Malak, meaning “angel” in Arabic. Seeing that heavenly little face immediately took me back to the day we first met, the day she escaped a war zone. People ask how it felt standing in the desert outside Fallujah, as the war against ISIS raged, meeting children who had suffered so much. But I can hardly describe it. Two year-old children with nothing to wear, no family, no home. I tried asking her questions like the other children, but she was barely holding back the floodgates. I put my camera down as she dissolved into tears. How could someone so young, who had endured so much—a siege, starvation, ISIS, the death of her parents—hold it in for so long? I look at her, and I see my daughter. Malak broke my heart. Malak’s story traveled all over the world when we shared it. People from every corner of the planet wrote us, offering help, prayers, encouragement, and words of lament on her behalf. Most people noticed her for her tears, but I remember her because of her smile. I’ll never forget her courage in the face of unbelievable suffering. She is more than just a victim to be pitied. She’s our Hero Angel to be celebrated, loved, and cheered. Our teams continued visiting Malak’s family with food and other aid, but I had to move on—as the refugee crisis spread to other parts of Iraq, as the war with ISIS carried on, and as your lifesaving work continued. Still, Malak was always there, in the back of my mind. It’s hard to see people in their worst state and then have to move on. We don’t just want to be first in when disaster strikes. We want to be last to leave. We want to see them through their darkest days and into a better future. After months of searching and waiting, we finally found her. 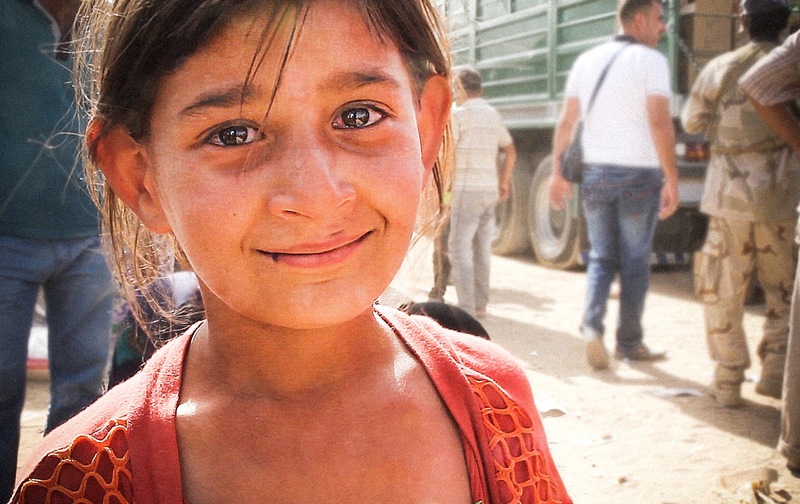 Malak’s family had returned to the town where they lived before ISIS. But everything is different now. Their house was destroyed in the fighting—and Malak no longer had the comfort of her parents. We got all the permissions needed to cross into this more dangerous part of Iraq, and then we set off. Malak is now eight years old. She is in school, and she has made friends since returning. She lives with her grandparents in this tiny home shared by about 20 people. Malak loves hopscotch and eats fruit almost exclusively—bananas, apples, and pomegranates are her favorites. Sometimes her grandmother manages to get her to eat rice and beans, but even that isn’t guaranteed. Malak’s parents married young, and they died together. As Iraqi forces fought to liberate Fallujah and the surrounding countryside, a stray rocket or mortar hit her parents’ car, killing them both. “It took us 15 days to identify the bodies,” her grandmother told me. As grandma and I sat watching Malak play football, I felt grateful for all the ways you’ve cared for kids like her. That little clip of her smiling through tears, telling me her daddy had just died… it was utterly heartbreaking. It haunts us, even now. But it is not the end of Malak’s story. It will not slow us down. We take these moments like a jug of gasoline and fling it on the fire—because pain and heartbreak can ignite into something beautiful, if we let them. Malak our Hero Angel inspires us. She fuels us to love anyway, give anyway, serve anyway, go anyway—because we know there are countless Malaks out there who need their future secure. As we go into 2018, we will continue showing up for children traumatized by war—including Malak and her family as they get back on their feet, and others just like them. When you give, you make this possible. You are first to show up, on a displaced child’s darkest day. But you’re also last to leave, until their future is secure. Until they have what they need to flourish. Give now to secure the future you imagine for Malak and children like her—a future full of hope and possibility. Imagine if we could be first in and last to leave for children whose lives are torn apart by war. Give today.